David See Surveyors LLC. is a small land surveying firm located in northwestern Pennsylvania. The sole proprietor, David M. See, is a licensed Professional Land Surveyor with over 31 years of experience in his field. His vast knowledge and adaptability enables him to be available for contract survey work. Major areas of involvement include the following: perimeter boundary surveying; urban planning; large tract surveys; oil and gas development; environmental planning; construction site development; and property subdivisions. Eagle Point 2002 drafting software is used for COGO routines, data collection, drafting, and site planning, which is integrated with AutoCAD 2002 for the preparation of accurate drawings. Mr. See graduated in 1972 with an Associates Degree in Drafting and Design Technology from the Electronic Institute of Pittsburgh. His continuing education includes courses from Penn State Behrend, Clarion State College, and Jamestown Community College. His prior work experience includes US Forest Service, Warren, PA; Jenkins and Erikson P.C., Jamestown, NY; and Michael Baker Jr. Consulting Engineers, Beaver, PA. 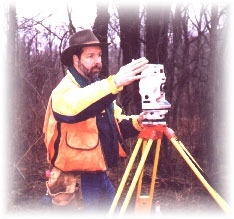 He also had the opportunity to instruct an elementary surveying class for the Civil Engineering Department at the University of Pittsburgh - Titusville Campus and has taught the surveyor's review course for those procuring state registration as outlined by Penn State and the registration board. Mr. See began his surveying firm in May 1978 with a staff of 3 employees in Youngsville, PA and later moved the business to Warren, PA. David See Surveyors has built a large client data base of maps and records in Warren and the surrounding counties. Mr. See's vast knowledge and expertise enables him to communicate well with regulatory agencies, such as the DEP, Conservation Districts, and Planning & Zoning Boards. Mr. See has taken an active role in community development; serving on the Youngsville Zoning Board, Warren County Planning Commission, Chairman of the Warren City Planning Commission, and Vice President of the Warren City Council. His accomplishments include Impact Warren and the Waterfront Development at Breeze Point Landing and the Soldiers & Sailors Park, Warren City Comprehensive Plan, restructuring downtown parking, and chairing the Hickory Street Bridge Steering Committee.